The attribution of this unusual table is based on similarities of detail, particularly the curtain-rod-like element below the top, which also appears on a cabinet the firm displayed at the Centennial Exhibition in 1876. The style of the table is termed Neo-Grec and refers to a new interest in classicism that emerged during the Second Empire in the 1860s in France and during the 1870s in the United States. 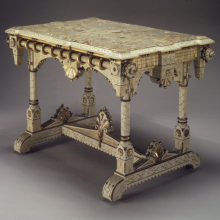 The table’s white, or ivory, finish, a rare surviving example, is also French-inspired and looks back to examples from both the ancien régime of the eighteenth century and the Empire style popular under Napoleon I in the early nineteenth century. A miniature painting consists of a diminutive watercolor-on-ivory picture—usually a portrait—housed in a piece of jewelry, a case, or a frame. During the late eighteenth and early nineteenth centuries, the miniature functioned as a token of affection that was treasured for its tiny likeness of a beloved friend or family member. Miniatures commissioned upon the death of a loved one epitomize the sentimental nature of these objects. In this double-sided locket, the finely rendered portrait of the deceased serves as a memento of the sitter, while the mourning scene on the reverse functions to memorialize his life. Mourning miniatures typically combined stock iconography—a bereaved figure, tomb, and weeping willow—with individualized inscriptions. 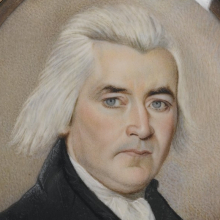 To further personalize the object, a lock or plait of the subject’s hair was set into the casework, or chopped hair was mixed into the paint used to depict leaves and grass, as in this example. This unusual object is an early water filter that combined the latest decorative style, Japonisme, with technological advances. Beginning in the late 1870s, artists and consumers in the United States became fascinated with the arts of “the Orient,” which had recently been opened to the West. The internal filter in this object was supplied by the Gate City Stone Filter Company, whose advertisement suggests the growing concern for hygiene in the United States in the nineteenth century. Thomas C. Smith was the head of both Union Porcelain Company, which made the porcelain shell, and the filter company that shared the same address in the Greenpoint section of Brooklyn. 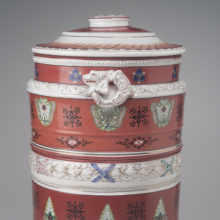 The water filter, which would have been proudly displayed in the dining room of a private house or in the office of a prosperous business, was produced during the dynamic tenure of Karl Mueller (1820–1887) as chief designer at Union Porcelain Works. A German-trained sculptor, Mueller was hired to create objects to show at the 1876 Centennial Exhibition in Philadelphia. The meaning of the letters in this colorful still life is a mystery, one whose solution may have been intensely personal for Hartley. The letters, and the clean, flat shapes that simultaneously seem to be pasted to the picture plane and register as objects in illusionistic space, recall the Cubist collage aesthetic that Hartley embraced during his stays in Europe. Handsome Drinks is one of the first paintings the artist completed after World War I forced his reluctant return to the United States. 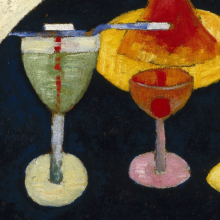 It features a glass of green absinthe, a potent drink associated with European café life, a social milieu that Hartley found extraordinarily stimulating. This statue of the Virgin is unusual for its combination of Spanish, Latin American, and Asian artistic traditions. The cosmopolitan society of the Vice Royalty of New Spain, which included present-day Guatemala, was shaped not only by cross-cultural native and Spanish influences, but also by its location at the intersection of a trade route between Europe and Asia. This statue is in the form of a Madonna of the ampona (broad) form, a cult figure made to be dressed with actual clothing. 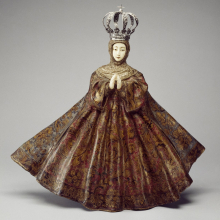 The dressing of deity figures was a common precontact native practice that the Catholic Church at first tried to discourage, but by the seventeenth century had come to accept, as native Christians appropriated and transformed Catholic forms. Although Virgins were generally dressed with real garments and usually had wood heads and hands, this figure’s robe is made of cloth stiffened with gesso and then painted, and the face and hands are ivory. These ivory parts may have been made in the Philippines and imported into the Americas, reflecting New Spain’s vital role in the China-Spain trade route. The aluminum prototype of this futuristic bicycle was handmade by the MG Auto Company in England in 1946 and incorporated an ingenious dynamo that stored the downhill energy and released it on uphill runs. 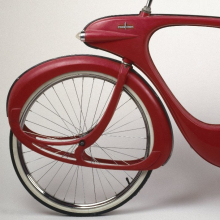 It was prohibitively expensive for consumer production, but in 1960 Bowden contracted with Bomard Industries in Michigan to produce a more mechanically conventional, one-speed version of the dynamic, organic design in fiberglass, a new design material. Ultimately the endeavor was too costly for Bomard Industries as well and the firm went out of business having manufactured only 522 examples. A major component of the Luce Center for American Art is the 5,000-square-foot Visible Storage ▪ Study Center. 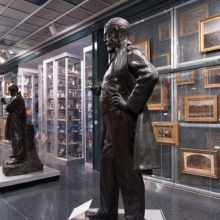 This dense display of objects offers an inside look at how museums work and provides a glimpse of our extensive American collections. As large as our building is, just a small fraction of the permanent collections can be displayed in our gallery space. 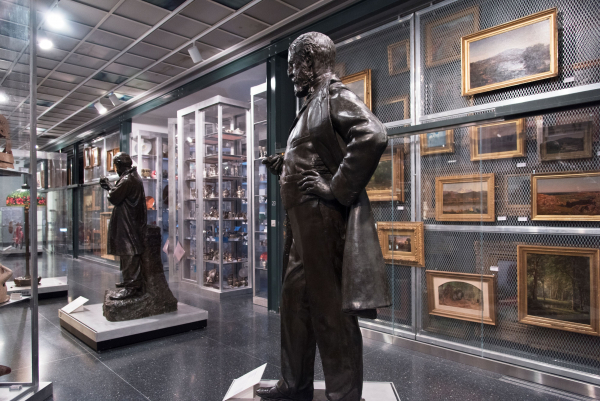 Whereas only about 350 works are on view in the adjacent American Art installation, this facility gives open access to some 2,000 of the many thousands of American objects held in storage, which are available for viewing and research by students, scholars, and the general public. The Visible Storage ▪ Study Center is a working facility as much as our other storerooms, with works maintained under proper conditions of temperature, humidity, and light levels. Glass-walled bays contain a rotating selection of nearly six hundred paintings on rolling racks. Large glass vitrines hold the majority of our collection of historical (that is, pre-1945) American sculpture. Other vitrines contain objects from the American decorative arts collection, including pewter, commemorative pressed glass, Tiffany glass and lamps, contemporary industrial design and furniture, silver, eighteenth-century furniture, nineteenth-century seating with original upholstery, and Brooklyn-made ceramics. There are also representative displays of Native American and Spanish colonial objects. Three areas are devoted to small exhibitions that change periodically and provide focused examinations of different art historical themes or aspects of the permanent collections. Although this is an operating storage facility, we have designed it to be welcoming and user friendly. Accompanied by informational booklets, selected “focus objects” are displayed on colored shelves, in cases, and on the painting screens. There is a searchable online database, also available in the Visible Storage ▪ Study Center.